Dr. David Mahjoubi, MD of the Ketamine Healing Clinic in Los Angeles offers Ketamine IV infusion to effectively treat depression and chronic pain. Of the roughly 85% who respond to Ketamine for Depression, 5% need four or more infusions to know whether they respond to Ketamine. I wanted to find an effective at home treatment so patients don’t have to keep coming back for booster treatments, as the out of pocket expense for the IV boosters can quickly add up. With the at-home Ketamine nasal spray, patients are able to save both time and money, says Dr. Mahjoubi. Dr. David Mahjoubi, a highly skilled board-certified anesthesiologist, is the owner of Ketamine Healing Clinic of Los Angeles located at 1964 Westwood Boulevard in Los Angeles, California 90025. The clinic offers Ketamine therapy to treat depression symptoms as well as anxiety, PTSD, and chronic pain. This represents a safe and highly preferred alternative to traditional over the counter prescription strength antidepressant medications, which are associated with significant side effects. Nearly 85% of patients respond to Ketamine IV infusion at Dr. Mahjoubi’s Los Angeles clinic. Of the patients participating in treatment, 70% notice significant results after just one treatment. However, in order to effectively treat the 5% who need a few more infusions, Dr. Mahjoubi now offers new infusion packages that include six and seven infusions in the first round of treatment. “It is our goal to help all patients realize the remarkable benefits of IV Ketamine when treating Major Depression, Anxiety, and other mood irregularities. Our new infusion packages address those that experience initial resistance to this therapy and simply need a few more infusions to enjoy the positive and often life-changing results,” says Dr. Mahjoubi of Ketamine Healing Clinic. Ketamine is a safe anesthetic medication that has been used in both humans and animals for over half a century. Ketamine's use in the operative room as well as treating chronic pain has been known for some time, but its efficacy in treating major depression has been realized only recently. Beyond offering Ketamine IV therapy, Dr. Mahjoubi leads the only clinic in the country to offer Ketamine at-home nasal spray as a convenient supplementary therapy to help maintain and extend the benefits of IV Ketamine infusions. “I wanted to find an effective at home treatment so patients don’t have to keep coming back for booster treatments, as the out of pocket expense for the IV boosters can quickly add up. With the at-home Ketamine nasal spray, patients are able to save both time and money,” says Dr. Mahjoubi. David Mahjoubi, MD is a Diplomate of the American Board of Anesthesiology. He earned his Doctor of Medicine at The Chicago Medical School. Dr. Mahjoubi carries over a decade of experience with intravenous Ketamine, beginning from his residency training at the University of Southern California (USC) + Los Angeles County Medical Center. He is the author of multiple publications in the medical field and holds high honors from his educational years. Following his residency, Dr. Mahjoubi joined the Anesthesia Group at Northridge Hospital Medical Center and became the most active user of IV Ketamine for both conscious sedation and general anesthesia cases. After working at surgical centers throughout Southern California, he quickly noted the beneficial mental health effects of IV Ketamine in many patients post-procedurally. 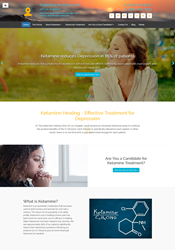 Ketamine Healing Clinic of Los Angeles was thus founded, and now provides a highly effective treatment for patients with treatment-resistant depression, anxiety, Post Traumatic Stress Disorder (PTSD), and chronic pain. To learn more about IV Ketamine infusion packages from Dr. David Mahjoubi, please contact the Los Angeles office at (424) 278-4241 or (866) 987-7874. You may also visit their website at http://www.ketaminehealing.com.